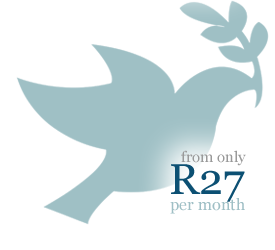 For as little as R27 per month, you could get a maximum cover benefit of R50-000 on your policy. That's a decent sum towards the expenses of your own funeral or any of your beneficiaries. One of the major highlights of Old Mutual is the extensive range of funeral products that they offer, and the outstanding benefits each one promises. These benefits are discussed further below. Old Mutual Funeral Cover is possibly the most important business in Old Mutual's business in South Africa. With varying funeral cover plans, you should consider getting Old Mutual funeral cover quotes to weigh the pros and cons of the each policy type against offers from other funeral insurance providers. In its funeral policies, Old Mutual offers an immediate accidental death benefit, and the option to double that cover under its comprehensive plan. You can also qualify for a money back benefit, where you are granted your premiums back if you die within 6 months of taking up the policy. Throughout the duration of your funeral policy, you can miss up to six months of your premiums without being penalized or your policy cancelled. R50-000 to R100-000 for you as the policyholder. Up to R30-000 for your spouse and children. Up to R15-000 for members of your extended family.